The Globe Theatre is situated in London, England. It is often associated with William Shakepeare as many of his plays were performed there. 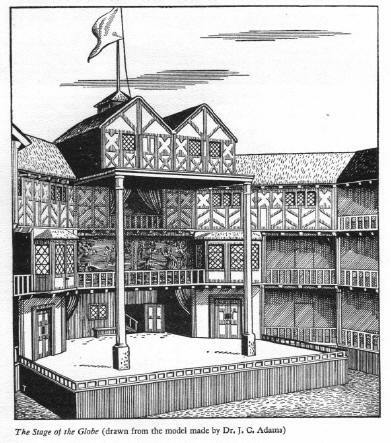 The Lord Chamberlain's Men created the theatre in 1599. It was lost in a fire when a cannon shot during a performance of Henry VIII ignited the thatched roof of the gallery in 1613. 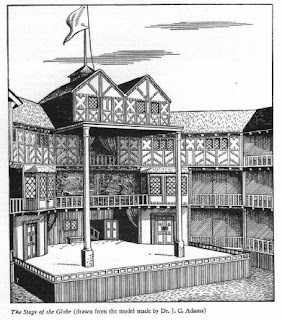 The theatre was re-built on the same grounds due to it's popularity in June 1614, but this was closed down in 1642. A theatre built in memory of the theatre was opened in 1997 near the original site, and was named "Shakespeares Globe". The Original Globe was built like the Coliseum in Rome, but smaller, it still could have an audience of over 1500 people and was an impressive theatre to work in. It was made completely open and the majority of the audience would stand and this made the theatre cheaper as the only people who would sit were the rich and the seats were actually placed above the stage. Different coloured flags would have been used outside the Globe to show the type of play that was to be performances. A black flag was used for a tragedy. A white flag would show that a comedy was to be performed. A red flag advertised a history. This Theatre was made famous by Shakespeare but the theatre itself was and is extremely impressive, made of mostly timber the area picked so that the performances could be performed during the day while the light was lighting up the entire area.